The dates for the 2014 World Series of Poker Asia Pacific were announced back in November of last year and since then we have been waiting for the full 2014 WSOP APAC schedule. Well, the wait is now over as the ten Australian WSOP events have been announced! When it was first announced that the World Series of Poker was going to be coming to Australia, it was the biggest poker news of 2012. Then the biggest news of 2013 was when the world’s biggest tournament actually took place, with Daniel Negreanu winning the WSOP APAC Main Event and capping off a historic moment for Australian poker. In early 2014, one of the biggest stories was that the World Series of Poker Asia Pacific (WSOP APAC) would be returning to Crown Melbourne in October and would now run once every two years, alternating with WSOP Europe. But the 2014 WSOP APAC dates announcement saw no schedule in sight. We would have to wait months for that and those months are finally over as the full 2014 WSOP APAC schedule has been announced! Taking place from Thursday, October 2nd – Saturday, October 18th, the full 2014 WSOP APAC schedule will feature 10 prestigious gold bracelet events – the most ever offered outside of the USA at one time. The $10,000 buy-in Main Event will run from October 12th – 18th. "Bigger and better is the best way to describe the 2014 WSOP Asia-Pacific," said WSOP Executive Director Ty Stewart. "New events at modest price points like the Dealers Choice and Terminator No-Limit Hold'em, plus an expansion of overall events and a move to springtime in Melbourne is designed to encourage the North American and European contingent to make this a can't miss event. Plus, we have secured the most comprehensive live television coverage in both the U.S. and Australia for both the Main Event and High Roller." Of course, Crown Melbourne will host the 2014 WSOP APAC and with more than 70 poker tables will certainly host dozens of side events, which will likely be announced at a later date. The 10-bracelet schedule of the 2014 WSOP APAC kicks off the same way it did in 2013 – with Event 1: $1,100 NLHE Accumulator. There are three Day 1 flights for this tournament and with more international interest and a new place on the Australian poker calander, last year’s field of 1,085 is likely to be surpassed. The second bracelet tournament on the 2014 WSOP APAC schedule is Event 2: $2,200 NLHE which is billed as a three-day championship event and kicks off a few hours into Day 2 of the opening event. Following the second event there will be Event 3: $1,650 Pot Limit Omaha (three-day event), Event 4: $1,650 NLHE Terminator (three-day event) and Event 5: $5,000 Pot Limit Omaha (three-day event). All of these tournaments run with a single Day 1 flight. It is the sixth bracelet event on the 2014 WSOP APAC schedule which sees things getting interesting as Event 6: $1,650 Dealer's Choice 8-Game takes place. No tournament of this kind has been held in Australia before and in fact, the first time the World Series of Poker runs a dealers choice event will be in Vegas this at the main WSOP. The next two bracelets awarded is a sure to be popular Event 7: $2,200 NLHE Six-Max, along with Event Event 8: $5,000 8-Game. The tenth and final tournament is Event 10: $25,000 High Roller, which begins on Day 3 of the big one. 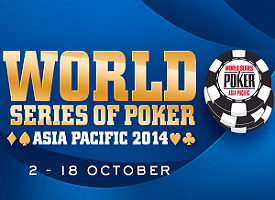 It is on Sunday, October 12th, that the $10,000 buy-in 2014 WSOP APAC Main Event begins. This tournament will run with two Day 1 flights and take place as a five-day event. The full details of the structure has not been announced yet, but it is likely to be very similar, if not the same, as last year. Another massive announcement to come out of the 2014 WSOP schedule is that the WSOP APAC Main Event and High Roller final table will include a television production which will be carried live (one-hour delay) on ESPN Australia and ESPN in the USA. This is the first time in the history of poker in Australia that a poker tournament will be aired on the same day it took place. The live production will be aired from 6-8 hours each day, meaning almost every hand of both the Main Event and High Roller final table will be seen around the world. Poker Asia Pacific looks forward to once again being the best place for all the latest World Series of Poker Asia Pacific news, results and more, so be sure to keep returning to stay up to date with the latest in everything WSOP APAC. We will be sure to let our readers know about all the WSOP APAC structures and all that important stuff once that news comes to light. Make sure to keep your browser locked to Poker Asia Pacific and like our Facebook page, follow us on Twitter, or join our Asia-Pacific and Australian poker forum to stay up to date with all the latest news and results from the World Series of Poker Asia Pacific (WSOP APAC).